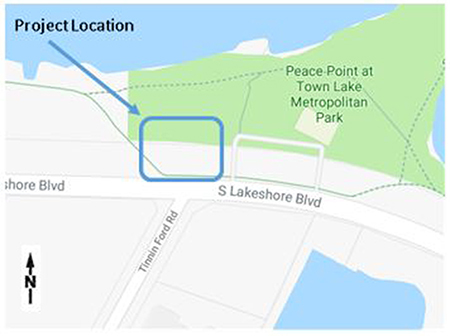 This project will repair failing storm drain pipes north of the intersection of South Lakeshore Boulevard and Tinnin Ford Road. Leaks in existing storm drain pipes have caused two sinkholes to form in Peace Point at Town Lake Metropolitan Park. We will fill in the sinkholes and create a large rain garden in the park. We will also construct a new storm drain inlet and replace the two existing 18-inch storm drain pipes with 24-inch pipes to direct rainwater from the road to the rain garden. 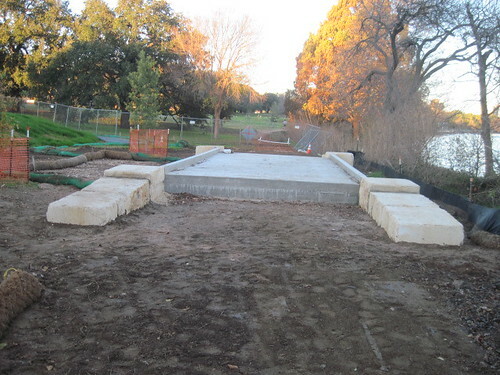 A new outfall (where rainwater will exit the rain garden) will be constructed to direct excess water to Lady Bird Lake. For more information about rain gardens, visit www.austintexas.gov/raingardens. This project is located north of the intersection of South Lakeshore Boulevard and Tinnin Ford Road. The project is nearly complete. Landscaping is underway, and the area will remain fenced off while the plants get established.